I have noticed a massive decrease in daily panic/anxiety. I started taking this twice a day and noticed a difference within 3 days. So amazing. I have recommended this to all of my close friends that suffer from anxiety. 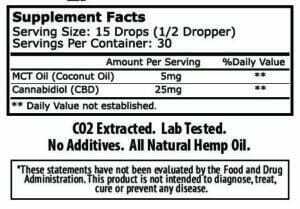 After seeing this change, I want to buy your entire inventory of CBD products. 🙏 thank you! So far I love it! Clean, nice oil base, and herby flavor lets me know I am getting the real thing. Dealing with the stress of work, lack of sleep and caring for a baby that’s suffering from eczema, this has helped me and my husband stay on an even keel. Calm and collected. I am absolutely enjoying this product. I use it for inflammation and mild pain management, migraines, for a better nights sleep, and more. It has helped me tremendously! Thank you! I love that they added MCT oil to this. You can feel the quality of this oil. I recommend for any athletes looking for a great recovery method! Great product!